Hello! Looking back over the year, you may have noticed that my Project Life / Pockets & Pages posts have pretty much been non-existent. I started the year off (as I do each year) with big intentions of documenting life and keeping up with my PL album. This year has been busier than usual as we moved and I am now working part-time out of my house. 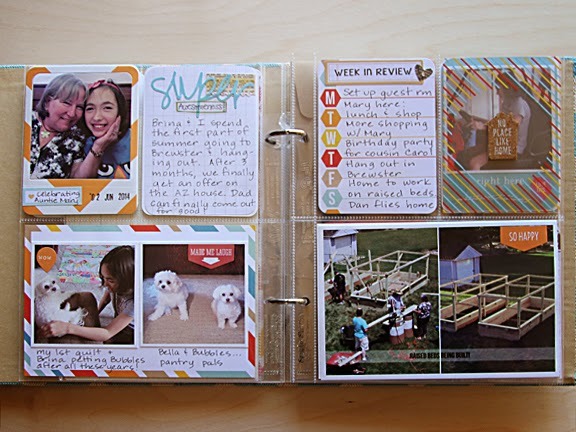 I am still documenting our everyday life, but I haven't had much time to work on my big 12x12 spreads. I decided not to worry about that and instead have started putting together a smaller album (6x8) documenting our first summer in South Dakota. My album begins in late May. The first photo is one of Sabrina taken on the last day of school. I printed it to be 5x7, slipped it into a 6x8 page protector, stitched the side and trimmed the side and top. 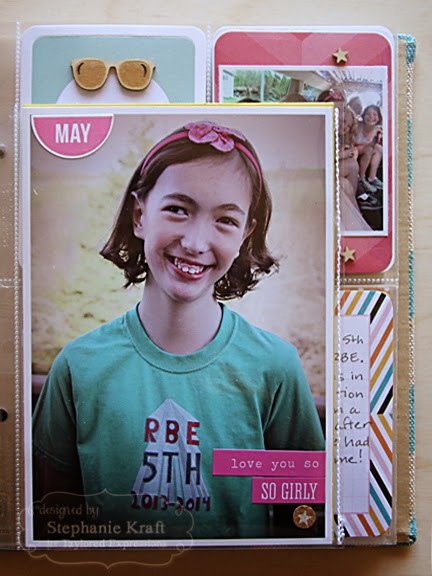 I used Journal Tabs - Month to stamp May and the included coordinating die. On the back side of the 5x7 photo, I wrote down our Summer Bucket List for 2014. 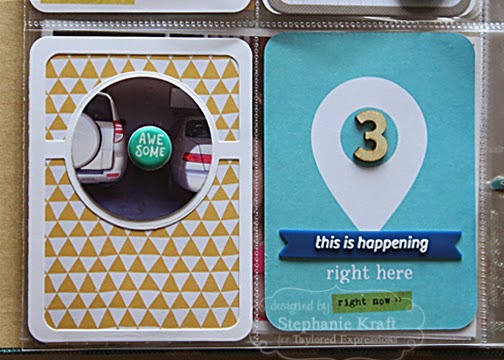 The right side of the spread uses a page protector with 4 - 3x4 openings. 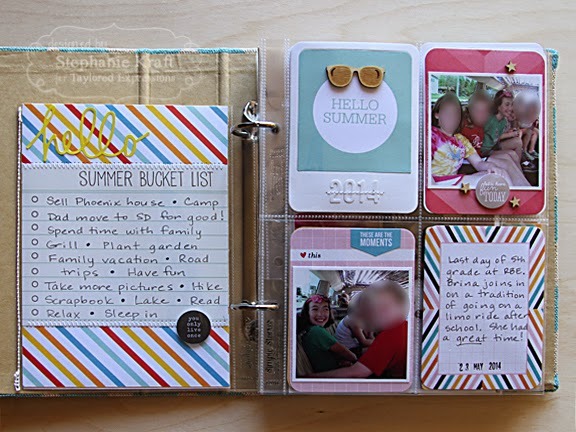 The Hello Summer filler card was trimmed to fit inside the Pockets & Pages - 3x4 Photo Frame and 2014 was die cut with the Mini Caps Alpha & #'s. The photos are from a limo ride that Sabrina took with some of her friends after school (photos of the other girls are blurred to hide their identity). I didn't go on the limo ride with her, but thankfully one of the moms who did took a couple of photos and shared them with me. I love how happy they look in these! The left side of the next spread includes the back side of the 6x8 page protector. I used Pockets & Pages - 3x4 Essentials and Pockets & Pages - 3x4 Part of My Heart. I included a couple of photos from Memorial Day weekend. 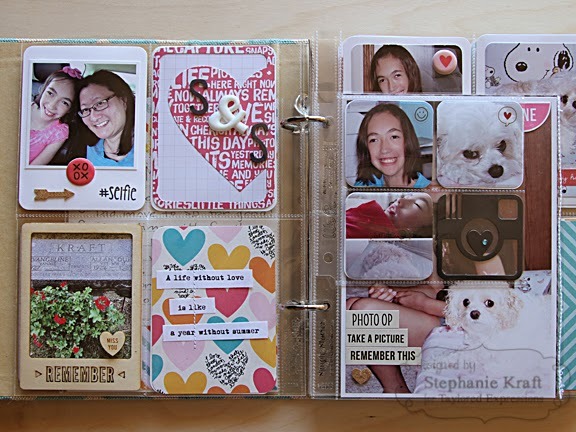 The right side is a 4x4 We R Memory Keepers page protector with slots for 4 - 2x2 photos. 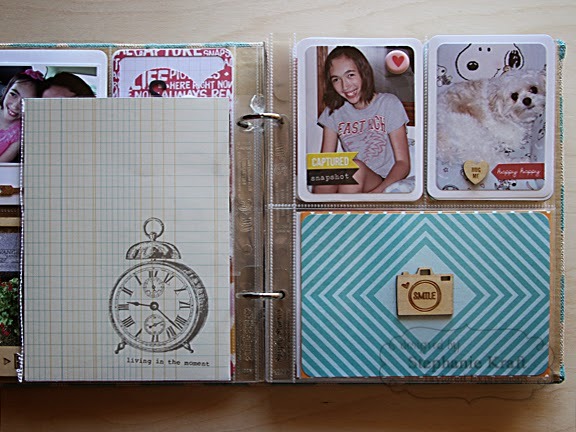 My photos were die cut with Pockets & Pages - 2x2 Essentials and the camera is from Pockets & Pages - Instasquares. Below you can see the rest of the 2x2 photos that I included on the backside of the page protector. These are just some random everyday photos taken in May. 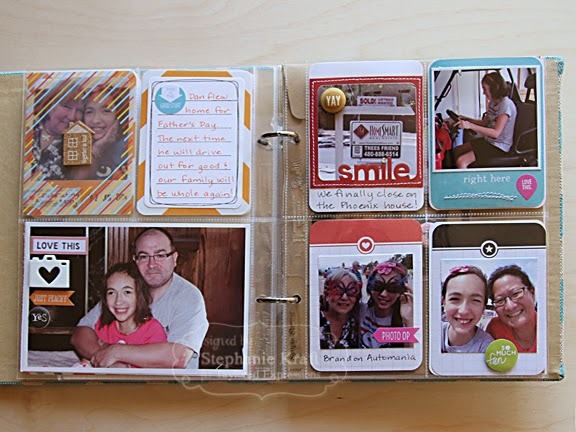 The right side is another 5x7 photo in a stitched & trimmed down page protector. I used Journal Tabs - Month again to stamp June. On the back side of the 5x7 photo, I added a sheet of patterned paper. 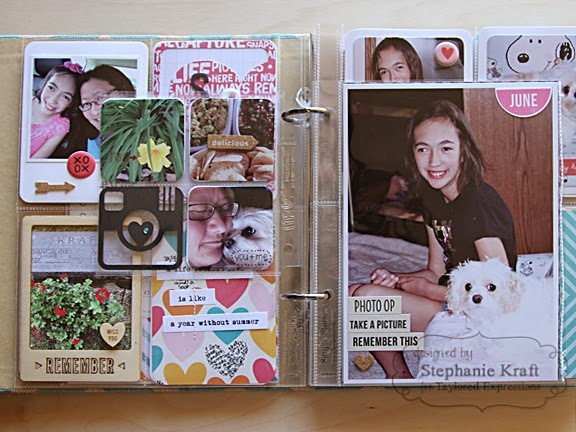 The right side includes a couple of photos of Brina and Bella hanging out (used Pockets & Pages - 3x4 Essentials to cut and mat the photos) plus a 4x6 filler card. My next spread includes more photos and journaling. 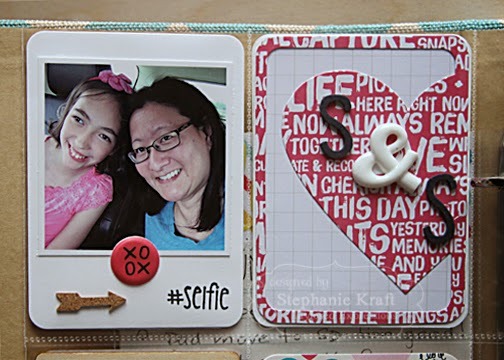 Once again, I used the Pockets & Pages - 3x4 Photo Frame on the left side. On the right, I used a pre-printed journaling card and added Week in Review (stamp included in Pockets & Pages Documented). On the left side of the next spread, I used a clear transparent card on the top left and the journaling to the right was handwritten after stamping the lines from Pockets & Pages Documented. 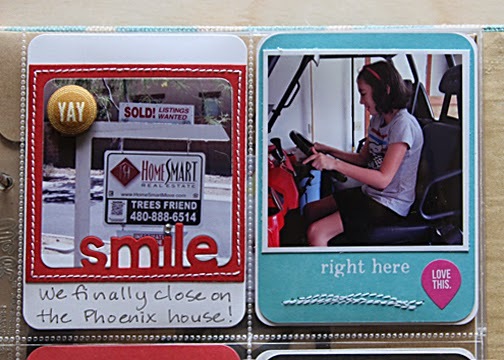 The "smile" frame on the right side of the spread is from Pockets & Pages Fab Frames. The final pages for June include the back side of the 6x8 page protector and a 4x4 page protector. I used Pockets & Pages 3x4 Circle Showcase on the bottom left pocket. Here's the back side of the 4x4 page protector where I added a few more 2x2 photos to sum up June. The star is from Pockets & Pages Instasquares. 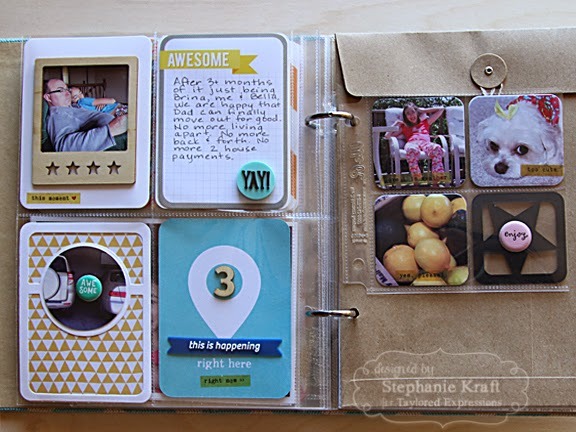 Basic supplies: I started with a Simple Stories Burlap album, various Simple Stories page protectors and summer journaling cards, Taylored Expressions Pockets & Pages stamps and dies, the Project Life Kiwi core kit, plus a variety of embellishments. The embellishments include items from my stash and various Freckled Fawn OhDeerMe monthly embellishment kits. I edit and print photos at home. It makes the process a bit longer, but I've tried pre-printing photos ahead of time and I always end up needing to reprint in different sizes, so it works best for me if I print as I go. That's all I have so far! I'll be back soon with more from my Summer album! This is FANTASTIC, Stephanie! WOW! 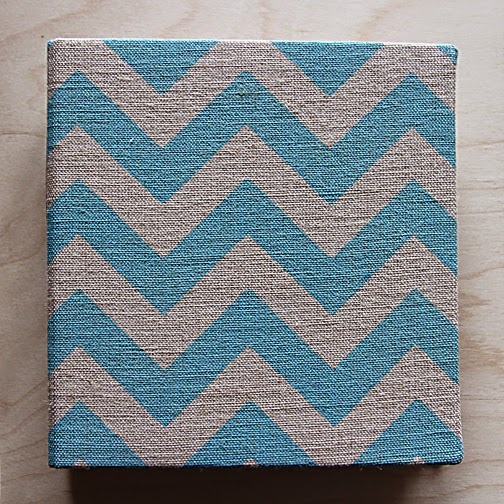 I LOVE it and LOVE all the TE Pockets and Pages Stamps & Dies that you've used! Beautiful pages Stephanie! I love all the photos and your attention to detail! 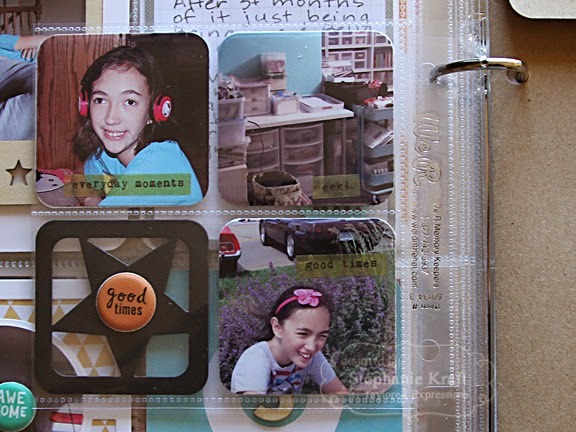 What a great way to document so many memories!